Have you been thinking to yourself lately, "boy howdy, I like Virtuous and all, but I really could use some new stuff?" Well, we've got you covered! We've added a whole host of new features. Here's the rundown of what you'll see this month. It's here! Users can now create a processing account and create donation forms within Virtuous and post them to their website. To see more of what you can do with Virtuous Giving, check out our recent launch webinar. It's also here! Thank you to everyone who helped as a beta tester over the last few months as we got the new import tool ready for prime time. With this release, the beta tool officially replaces the previous version of the import tool. If you haven't seen it yet, you can check out our beta release video for some key highlights. Now, everyone can process gifts more quickly and efficiently. Creating new Campaign Communications and Segments isn't too tricky, but what if you could create multiple Communications and Segments all at once? 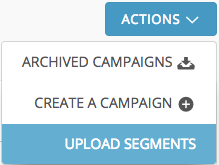 Well, now users can click on the Actions menu on the main Campaigns screen and select the option to Upload Segments. The upload screen includes a link to the Virtuous Segment Import template. Complete the template to map Communications and Segments to any existing Campaign(s). Some Admin users have received error messages when trying to enable integrations - not anymore! The Gift Ask Status is now available in the Gift Ask Download from the Gifts screen. As it should be.